Your journey start in George – Take the turn-off onto the historic and scenic Montagu Pass and follow the signs to Herold Wines. Cool mountain mists keep summer temperatures moderate and create a long ripening season for the Pinot Noir and Sauvignon Blanc. Things to do: Cellar tour; wine tasting; tearoom; bring your own picnic; mountain pool; farm and fynbos walks. From here, travel through Herold, turn right onto the R62 and left onto the gravel road to Dysselsdorp over the Perdepoort Pass. 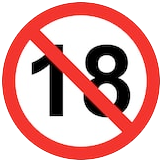 Turn right (north-east) onto the N12 to Doornkraal Padstal for their Tickled Pink sparkling or some fortified wines. Things to do: Browse through the country shop with lots of local goodies. Find wines from all the cellars in the Klein Karoo at cellar prices. A Klein Karoo wine shop! Now towards Oudtshoorn. Things to do in and around Oudtshoorn: Hug, ride or feed an ostrich; stroke a cheetah; dive with crocodiles; Meerkatmagic; feed an elephant; ride a camel; Cango Caves; zipline; ostrich products; township tours; kloofing; horse riding; hot air balloon; game viewing; mountain biking; absailing; caving; Klein Karoo food and wine. Karusa Vineyards is 15km from town along the R328 in Schoemanshoek. Things to do: Taste superb wines and handcrafted beer; eat at the deli; relax on the stoep. The shortest route back to George is the N12 or, if you are more adventurous, stock up with traditional witblits and local gin at Grundheim Wines. Travel from there on the R328 over the Robinson Pass to Mossel Bay for a sundowner on the beach. 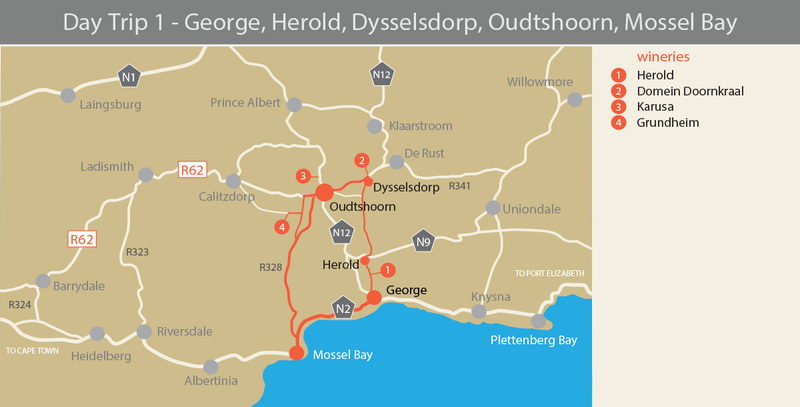 Distances: George to Herold (22 km) – Herold to Doornkraal (39 km) – Doornkraal to Oudtshoorn (23 km) – Oudtshoorn to Mossel Bay (77 km) – Mossel Bay to George (44 km). Round trip is 205 km. Oudtshoorn is a great place for outdoor activities. Surrounded by mountain ranges and blessed with a rich variety of bird and plant life the Klein Karoo reveals its beauty to those who get out and make the effort to explore. The Wilgewandel Holiday Farm have recreated the era of the 1700 pioneers of Southern Africa with their Wilgewandel Pioneers Experience. See how they lived, dressed, played. Listen to their music. Taste their cuisine. The farm also offer a wide variety of fun activities for young and old, including camel rides, walking trails, animals to feed, donkey cart rides, and a restaurant. Oudtshoorn is the ostrich capital of the world. Ostriches are found in great numbers and the region produces the best feathers, leather products and ostrich meat in the world. Birding in the Klein Karoo, and particularly the Oudtshoorn area, offers a large variety of bird-friendly habitats. This ensures that a diverse variety of birds can be observed within a relatively short drive from hotels and guest houses in the area. These habitats include vegetation along permanent streams, the thickets on the slopes of hills, the fynbos which is found on the tops of hills and on the Swartberg itself, the open karroid veldt with its succulent shrubs and man-made habitats such as dams and tree rich local gardens. Try the quad bike trail to the beautiful, 80 m high Rust-en-Vrede Waterfall; the fantastic quad biking trips over the Swartberg Pass, to “The Hell”; a sunset cruise or quad bike game viewing at Chandelier Game & Ostrich Farm. To find out more about Oudtshoorn and its surround, places to stay, where to eat or to get the contact details of the activities mentioned, please contact the Oudtshoorn Info or the Oudtshoorn Tourism Bureau.